Placed above is a satellite image of severe cyclone "NARGIS" and its predicted track as on 29Apr2008 at approx 1600hr. This, as far as I know is the first one this season- many more will form in the Bay in the months ahead. 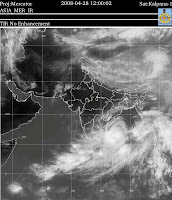 "Cyclonic Storm “Nargis” over southwest and adjoining southeast and west-central Bay of Bengal near Lat. 13.00 N and Long 85.50 E, about 550 Km east of Chennai, remained practically stationary and intensified into Severe Cyclonic Storm at 1430 hours IST of today afternoon, the 28th April 2008. The current meteorological analysis and Numerical Weather Prediction models suggest that the system is likely to intensify further and move in a northwesterly direction slowly for some more time. Thereafter, it is likely to recurve and move northeastwards." I am from Kalimpong and as such all of my blogs/ reports/ photographs etc pertain to my town - which may be giving an impression that only Kalimpong suffered a battering in Sep07. I know for a fact from several scientists that I associated with over the last few months that Kurseong was perhaps the most badly mauled. 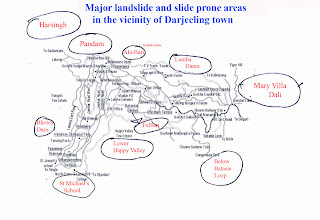 Placed above is a rough sketch of Darjeeling town with the major landslide and slide prone areas. This is my letter to Mr ND Chingappa (IAS), Chief Secretary, Govt of Sikkim, Gangtok, Sikkim (faxed and confirmed received at his office today). As you would know, in Sep07 the whole of Darjeeling district and Sikkim received a terrible lashing by the monsoons and much damage was sustained in both the regions due to landslides. Subsequent to this we, in Darjeeling district formed SaveTheHills, which is a group of people trying to raise awareness about landslides in this part of the world and also demanding proactive steps to prevent this hazard by the government and NGOs. a) Most of the landslides which have taken place in the recent past are the direct or indirect result of human action on the environment. As such this hazard must be combated by amongst other things, a massive awareness program in the entire hills of this area. b) Experts such as Dr RK Bhandari, Centre for Disaster Mitigation and Management (CDMM), Vellore Institute of Technology must be brought in to offer short and long term solutions to the problem of landslides. c) As per the Geological Survey of India, the nodal body looking after landslide hazard in the country, the entire region of Darjeeling district and Sikkim is the most landslide prone area of the country. The fact that global warming and climate change will only increase this hazard makes it more imperative to work together and with haste towards prevention of this common hazard. d) Years of neglect by ignoring the hazard, underestimating the seriousness of the problem and non implementation of preventive measures has brought the whole area into a situation which is both serious and perilous – any further delay in taking proactive steps at the government and NGO levels will spell doom to the peoples living in large parts of these hills in the near future. With all these factors in mind, it will be only apt to conduct a workshop on landslides and disaster management, drawing in experts, NGOs and concerned government departments of the Centre and State as soon as is possible. I understand a work shop was organized in 2004 by the Indian Institute of Geomorphologists (IGI) in Gangtok but what was the eventual outcome of the exercise is not known to me. Since Sikkim as a state will have all the resources to bring together such a meeting. May I request you to kindly take the lead in this respect? Please visit http://www.savethehills.blogspot.com to have a look at reports, letters, issues and photographs which have emerged from our 6 month long study of the landslide problem in the hills of Darjeeling district. "It will go, it will go in the rains (barkha) this Jul-Aug..."
Rai Gaon, Barabhalukhop, Kalimpong is an area which I visit often. Yesterday, during one such visit I met Mr Man Bahadur (MB) Subba, aged 65yrs who owns approx 3 acres of land there. After the rains last year I had visited his place and talked to his son but I somehow never met him in person. "it will go ... in Jul/Aug"
a) The cause of the landslide here is again a jhora (mountain rivulet) which is devouring the land that it ploughs through. b) Again, landslide prevention work stopped here years ago and whatever was done then stands out like some archaeological relic from history. c) After the recent meeting with the DGHC administrator, Mr BL Meena (IAS), I am hopeful that landslide prevention work will again resume but frankly it will take years before we can see the result of any corrective action. b) Considering the govt machinery may not have the where with all to deal with this in the time available before the monsoons, does it plan to include NGOs? Have such NGOs been contacted? c) Since the monsoons are barely a month away, what sort of post disaster (relief) measures are in place? d) Have any landslide prediction equipment been installed in heavily populated landslide prone areas (eg Tungsung) as requested by STH in their letter to the CM last year? e) On 02Nov2007 in a meeting with Mr A Purkayastha (IAS), PS, Disaster Management (Govt of W Bengal) at the Circuit house in Darjeeling, it was decided to induct HAM radios as a part of communication gear in a disaster scenario in the hills. STH had recommended that ex-army people be utilized to man this equipment, since they already have basic knowledge and training in wireless communication.What is the progress on this? f) Having mentioned that disaster management experts should be consulted, can we have a rough time frame when will this be done? g) The GSI and Dept of Science and Technology were in the district recently studying landslides, are their reports available with the administration? h) Since the issues involved in landslide prevention is bound to be an immense task which will be beyond the scope of any one agency, will NGOs be included in the study and planning of landslide prevention work in the future? j) One of the main issues regarding utilization of funds during the time of the previous administrator (Ghising) was the lack of transparency and the large scale corruption which ensued. Since landslide prevention has been neglected over the last decade in Darjeeling district, restarting it will involve injecting huge amounts of money, in agencies such as the irrigation department.What sort of checks and balances does the administration propose to have in order to ensure we don't have repetition of what happened under Ghising? k) To deal with this huge problem which includes issues such as raising awareness against landslides/relocation of people/aforestation etc, one would expect government agencies and NGOs to network and share their expertise and resources. Experts in this field such as Dr RK Bhandari, Chairman, Centre for Disaster Mitigation and Management, Vellore Institute of Technology with whom STH is in touch may also be appointed as advisors. Can we request the Administrator to call a such meeting where we may be able to combine our efforts and fight the hazard of landslides not only in the district but also in neighboring Sikkim and also other landslide affected areas? Kalimpong, April 16: DGHC administrator B.L. Meena has agreed to take up landslide prevention work in the hills on a priority basis. He, however, cautioned that it would take time to accomplish the onerous task. After meeting representatives of NGOs like Citizen Rights Forum, Kalimpong, and Save The Hills, Meena said the Bengal government has already identified roads, drinking water, rural electrification, education and health as priority areas, and landslide prevention would be added to the list. “We will have to consult government experts on disaster management. We will start working on it, but it will take time,” Meena said. The DGHC administrator, however, added that the forced closure of government offices would only cause further delay in development work. The Gorkha Janmukti Morcha has begun an indefinite shutdown in all government offices in the hills from Monday. “Clearly, the DGHC administration can do nothing much if offices continue to remain closed like this,” agreed N. P. Dixit, the president of the rights forum. Dixit and his team in their meeting with Meena suggested five priority areas for him to work on. While road, water and electricity were common areas of intent, the rights body also suggested agriculture and landslides. “We also suggested setting up of review committees in all the three hill subdivisions to oversee the implementation of development work,” said Dixit. Meena, on his part, said he would welcome any arrangement that would ensure transparency. The decision of the administrator to meet teams of citizens was hailed as a welcome change from the style of functioning of the previous regime. “Let alone common citizens, the previous administrator (GNLF chief Subash Ghisingh) did not even entertain the views of his own party members,” said an NGO representative who met Meena today. The Administrator's decision to include landslides in the priority areas of the Darjeeling Gorkha Hill Council (DGHC) is a long overdue step. While I welcome this, I would like to add a word of caution here because the rot has taken years to seep in ie landslide prevention has been neglected for decades in these hills and so expecting a quick and easy solution to the problem would be naive. Nevertheless, it is "a great leap forward" and in the right direction. I would like to thank, Mr NP Dixit, President of Citizen's Right Forum, Kalimpong who made it possible for STH to brief the Administrator in person. In a lighter vein, the dog eared and now torn chart on the wall is a hand drawn map of Kalimpong which I have used over the past 6 months to talk to politicians, students, scientists, farmers and now the Administrator of DGHC about the landslide issue. Placed below is an excerpt from the Telegraph today. Kalimpong, April 15: A private telecom company has dug up long stretches of the most important road running through the subdivision to lay optical fibre cables, raising the spectre of a commuters’ nightmare if the task is not completed before the onset of monsoon. Vodafone Essar Ltd is laying the cables from Chitrey on NH31A to Pedong via Kalimpong town and from there up to the Sikkim border. The existing drains alongside the road are being dug up for the work and already, transport operators and commuters are complaining about how narrow and dusty the stretches have become. “Many parts of the road were only recently repaired after they were damaged during monsoon last year. Now, it is back to square one,” said Pranay Thapa, a driver. However, both the mobile company and the Bengal public works department (PWD), which maintains the 29km stretch from Chitrey to Algarah (Lower Rishi and Upper Rishi Roads), promised to complete the major part of the work before the rains. “The company has deposited about Rs 72 lakh with us. As soon as they finish laying the cables, we will begin constructing the drains and repair the stretches of the road that might have been damaged because of the digging,” said Nihir Kanti Biswas, the executive engineer of the PWD’s north Bengal construction division. “We will employ a strong work force and should complete our part of the work within 15-20 days of taking up the job,” said Biswas. An official of the mobile firm told The Telegraph over the phone from Calcutta that most of the work would be over before the rains arrive in early June. “Thereafter, work will be taken up only along small stretches,” the official added. Environment activists here, however, are not willing to take the assurances at face value. “We will take up the matter with the administration. Here we are crying ourselves hoarse about the choked jhoras (streams) that trigger landslides and these people dig up the channels alongside the road,” said Praful Rao, the convener of Save The Hills, an NGO. P.T. Sherpa, the subdivisional officer of Kalimpong, has already sounded a warning to the PWD, asking them to complete the work soon. “The roads are already in a mess. If they don’t complete the work quickly, I may have to initiate administrative action,” said Sherpa. Both Mr NP Dixit, President of Citizen's Right Forum, Kalimpong and I have subsequently spoken to Vodafone officials in Kolkatta...they have assured us that the work will be complete in 10days time...something which I personally doubt. The SDO, Kalimpong also has been apprised of the issue by us. Amongst the many people, that letters have been sent to regarding the landslide problem in this area is Dr RK Bhandari, Chairman, CENTRE FOR DISASTER MITIGATION AND MANAGEMENT, Vellore Institute of Technology, Vellore. I thank you for sending me a copy of your letter dated 28 March regarding Landslide Hazard in the Darjeeling District. addressed to the President of the National Disaster Management Authority of the Government of India. In my view the landslides in the Darjeeling District are not only your concern but indeed a national concern. I fully share your concern and let me assure you that personally I will do everything possible to make my humble contribution which can only be of intellectual nature. The major initiative will have to come from the Government of West Bengal and the Government of India ( NDMA + Ministry of Earth Sciences + Department of Science and Technology + DGBR). I am aware of the profound interest being taken by HE the Governor of West Bengal and I do hope that we can all act with speed for stitch in time. If you have any documentation, reports , maps and statement of problems, please feel free to send those to me by email or post. You are also welcome to visit me either in Vellore or in Delhi on any date of mutual convenience. I would have even visited you myself but that would not serve much of a purpose unless a multi-disciplinary team is provided with necessary resource and charged with the responsibility to come out with a solution. For facilitating investigations and remediation with speed, may I suggest the following for your immediate attention. (1) Procurement of the related base maps ( topo sheets)from the Survey of India. The larger the scale of maps, the better. (2)Mapping of landslides of major concern on the maps. Please number these landslides for easy identification. (6) Obtain past rainfall data and ensure that continuous rainfall data is available related to all sites. (7) Take photographs of special features , observations , cracks , tilted trees , poles etc. (8)Establish a team of retired experts living in Darjeeling District and involve them in the studies. (9) Evacuate /Vacate a building if the landslide seem imminent. Dr R.K.Bhandari is an acknowledged authority in the area of Natural Disaster Mitigation and Management, with pioneering contribution in the discipline of geotechnical engineering. The main thrust of his work continues to be on sustainable development of Hilly Regions including the State of Uttaranchal where he spent more than a decade. Dr Bhandari's qualifications include a B.E., Rajasthan, M.Tech in Geotechnical Engineering, IIT Bombay, D.I.C, Imperial College, and PhD in Engineering, University of London. Dr. Bhanadari has served with distinction, earlier, with the Central Road Research Institute, Central Building Research Institute, as visiting faculty with University of Wollongong, Australia and the UN Centre for Human Settlements, and CSIR. His very intimate involvement in study of major natural disasters in India especially the great Mapla tragedy, the Orissa Super Cyclone and the devastating Bhuj earthquake, eventually prompted him to move to Chennai as the Director of Centre for Disaster Mitigation and Management in March 2001 where he is currently placed. Dr Bhandari has nearly 200 research papers, half a dozen monographs and 8 patents to his credit.As a member of the High Powered Committee of the Government of India on Disaster Management Plan, he gave the vision of Disaster Free India. His report on Seismic Microzonation submitted to the Department of Science and Technology of the Government of India has become a landmark contribution. His idea of setting up a Disaster Knowledge Network for India is now a part of the recommendation of the High Powered Committee to the Government of India. . In recognition of his outstanding professional contribution, the awards bestowed on him include Bhasin Foundation Award in Engineering & Transportation; Plaque of Honour from the Japanese Society of Soil Mechanics; Plaque of Honour from the South East Asian Geotechnical Society; Jaikrishna Prize of the Institution of Engineers (India); AIMIL Gold Medal; IGS Kuekalmann Award and Eminent Engineer award of the Institution of Engineers. Honors from the highest professional bodies included fellowship of Institution of Civil Engineers, London, Indian National Academy of Engineering Institution of Engineers, and Indian Geotechnical Society. The Department of Science and Technology, Govt of West Bengal is responsible for, amongst other things, preparation of high resolution maps based on satellite imagery which may then be used for locating landslide zones with great precision and in landslide zonation studies. A team, from this dept lead by Dr AR Ghosh, Senior Scientist visited Darjeeling district and were in Kalimpong 07-08Apr08 for ground verification of the landslide zonation maps. On being contacted by them on 07Apr08, I took them around to some of the landslide affected areas around Kalimpong. a) Aforestation programs seemed woefully inadequate in the hills. Dr Ghosh, while stating that aforestation was lagging behind in the plains observed that it was almost totally nonexistent in the hills and unless this was pursued more aggressively, landslides would continue to extract a heavy toll. b) The landslide problem was so huge that no single agency (not even the government with all its resources) could wave a magic wand to rectify the situation. The government could, for example carry out jhora training on a massive scale but they would never be able to look into vast catchment areas which fed water into the jhoras. Neither would the government be able to manage the aforestation program without the help of the local people. So landslides would have to be resolved as a social issue, with NGOs, political parties and the people being involved and in all this awareness of the causes of landslides played a key role. c) Landslide prevention measures since Sep07 in the areas visited were also virtually nonexistent. Politicians are breed of people who are generally keenly aware of issues at hand. However, since landslides are an issue which cuts across all party lines in the hills, an awareness meeting was held at the Town Hall, Kalimpong on 02Apr2008 in a bid to get them onto the landslide prevention bandwagon and to insist on better preparedness against this hazard in the monsoons ahead. HFF, (an NGO based in Dungra, Kalimpong) had invited all political parties in Kalimpong for a dialogue regarding adequacy of preventive measures against landslides with a view to get them involved in the process. Leaders from all political parties and their members (except for the BJP and the Gorkha League) attended the meeting. Mr Nayan Pradhan, (President, HFF) welcomed all the participants to the meeting and asked Wg Cdr Praful Rao (retd), Convener, STH to continue. A 45min powerpoint presentation was given on the landslide situation and also the course of action taken by STH for the last 6 months by Wg Cdr Rao (retd). The participants also contributed their experience regarding landslides and relief work. Various view points were discussed, but finally it was decided that SDO should be requested to conduct a meeting of various parties and departments involved in landslide prevention to find a solution to the problem. The President of the GJMM (Kalimpong branch), the leading political party of the region met members of HFF after the meeting and assured them that his party would open a special cell which will provide necessary assistance to the endeavor of Save the Hill Campaign and Himalayan Farmer's Front to bring Government attention for preventive action against landslides.